Love, Haha, Wow, Sad or Angry. If you’ve been on Facebook recently, you’ve probably noticed that Facebook has finally added five more ways for you to react to a particular post. Many businesses will find this feature important since these new emoticons now provide a way for you to know what users feel about your service instantly. Here are some more ways your social media page can make the most out of Facebook reactions. Sometimes, audiences won’t know how to react to your posts. You can point them in the right direction by giving call to ‘reaction’ phrases like “Did you learn something new? Give us a ‘wow’ by hovering over that like button”. 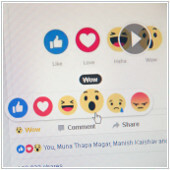 As Facebook reactions are a relatively new feature, you can increase the total engagement of your posts by simply asking your fans to use one of the six available expressions on your post. This will not only increase your overall engagement and reach but will also give your fans the opportunity to learn about the new Facebook reactions. If your service ever experiences any technical difficulties, reactions can be a lifesaver. Back when there were no Facebook expressions, people would often resort to negative comments or trolling when they are unhappy with a particular post. This could lead to a toxic page environment and may encourage others to do the same or even unfollow your page entirely. With Facebook reactions, you can minimize the effect of negative reviews with a more innocent ‘angered’ or ‘saddened’ emoji. Overall, this looks better on your page rather than lines of nonsensical text in all caps. Commenting and reacting to other local pages on your business’s Facebook account increases your chances of being discovered by potential customers. And, as an added benefit, engaging with other local pages can encourage them to return the favor. Facebook reactions add an extra level of depth to measuring how well your posts are doing. Before, more likes would mean more engagement. But now, reactions show that people are invested in your content. What’s more, you can now measure what people feel about your content. This allows you to tailor your next post so that it gets the most engagement. For instance, if you notice that people are leaving more ‘Haha’ reactions to your posts, then this could suggest that your audience engages with your posts if they see more humor included in your content. You should note that page posts are public and can be see by anyone, even those who haven’t liked your page yet. This also means you can review your competitor’s posts and find out how people are reacting to their posts. This is valuable information to gauge what type of content, announcements, or status updates work for your target audience. Or if you find that your competitor is only getting likes rather than reactions, you can try experimenting with creative posts to get people to engage with your content instead. Facebook reactions create a new and exciting way for people to express how they feel about certain posts. While some social media marketers would not pay too much attention to this feature, focusing on reactions can give you an edge when it comes to measuring how your target audience feels about your service. So the next time you’re going to make a new post, consider some or all of these tips to make the most out of those Facebook emojis. Need more advice on managing your Facebook page? Contact us today.